“Crowdsourced” songwriting podcast Rise and Shine TV has released a special 3-track EP this week, all remixes of their popular song “Water On The Moon.” The album is being published by the dPulse label, home to such artists as Adrian Belew and Digital. 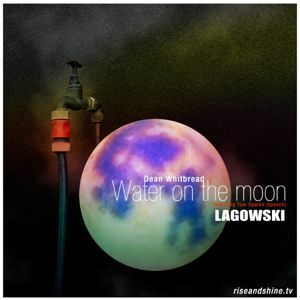 The three tracks on the mini-album include two deep remixes, titled “Drop Trajectory” and “Sparks” by “dark techno eminence” Lagowski, along with a really upbeat 145bpm “space dance mix” by Dean Whitbread, the creator or Rise and Shine.Â The three tracks all sound beautiful, sometimes ominous, sometimes dance-y, and all sound so different from one another (which, I guess, is the beauty of well-done remixes). The EP is available for download for $2.97. The Rise and Shine show is a songwriting podcast that incorporates audience ideas into the daily writing of a song, and uses the proceeds from selling the songs to support music-related charities. Previous Rise and Shine cycles included a session during the spring of this year, and a Yuletide project at the end of last year.